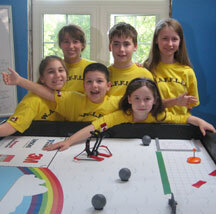 Our FIRST LEGO League (FLL) team was first established in 2006. We typically have 4-7 members on our team, ages 9-14. Our core team name, W.A.F.F.L.E.S. is an acronym for “Wild About Family & Friends Learning Engineering & Science” and we think we live up to our name! Most recently we have expanded to include a third team. During the main FLL season we meet at least two times a week (with lots of homework in between) to design, build and program our competition robot, as well as prepare our research presentation. Parent involvement and support is required. Meetings: Twice a week September-November, plus additional meetings as scheduled. In competition we have 2.5 minutes to autonomously complete as many of the missions as possible on a 4′ X 8′ field table with our LEGO Mindstorms robot. Each mission is based on the year’s theme, so each year students learn about a different “real-life problem”. We also have a five minute research presentation, along with a five minute technical interview. Amazingly enough we spend hundreds of hours preparing for these few short minutes, but it’s lots of fun and we learn a lot! As much as FLL teams are about building, programming and research it encompasses so much more. Teams learn about time management, teamwork, self confidence, leadership and core values such as integrity, good sportsmanship and sharing with the community. Contact us for more information about joining one of our FLL Teams. Please note that there are usually waiting lists to join our FLL team(s) and we often fill these spots with students from our summer camp.